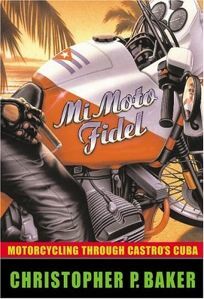 Often hilarious, sometimes hair-raising, this engaging travelogue documents Baker's journey across Cuba astride a gaudy BMW motorcycle. The thrust of the book is relatively simple: child of the New Left grows up, takes monstrous icon of capitalism to former ideological paradise, locals ooh and ah at the chrome behemoth and the freedom it supposedly represents, writer becomes disenchanted, denounces socialism. Throw in enough skirt chasing by the 41-year-old Baker (a travel and natural science writer) to elicit images of a Yorkshire Mickey Spillane, and you've got an entertaining and thought-provoking, if frequently meandering, tale. Baker encounters an extraordinary cross-section of Cubans, including Fidelistos loyal to el barbudo (a nickname for Castro) and dissenters who speak of betrayal and corruption. Baker's own somewhat ""pro-triunfo"" beliefs change as he slowly cracks el manto (literally, ""the mantle"" of ideology and government propaganda) and sees what many believe to be the true product of Castro's regime. Baker's ideological revelation is compromised by his basing his transformation almost entirely on one conversation with a formerly middle-class couple, and by his inability to convince the reader that Cuban corruption has been more devastating than the U.S. economic stranglehold. His dabbling in ideology mars the book slightly; still, if the reader accepts Baker's treatises as nothing more than amateur musings, this account of a marvelously eccentric trip remains a very engaging read. Eight pages of full-color photos. (Feb.) Forecast: The clever cover, in reds and golds, will have browsers lifting this off shelves to see what it's all about.